Divided We Stand. United We Conquer. On Saturday Night December 8th, AWA New South Wrestling RETURNS to Bowling Green for the 2nd Annual Toys for Tots Wrestling Event. All the action takes place at the National Guard Armory located at 920 Morgantown Road. Doors will open at 6 PM with a 7 PM bell time. Admission is $10 with kids ages 5 & under admitted FREE. You can receive $2 off your admission price by bringing a new unwrapped toy for donation. This event will benefit Toys for Tots of Southern Kentucky. 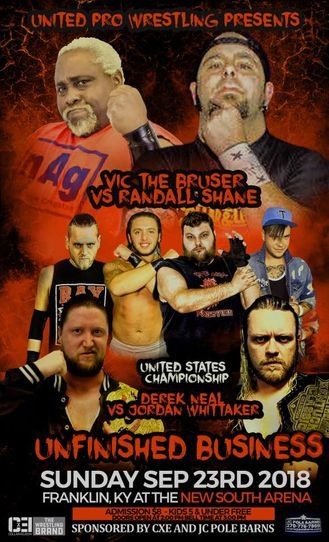 United Pro Wrestling returns to Franklin, KY on Sunday Afternoon September 23rd for "Unfinished Business." Doors will open at 2 PM with a 3 PM bell time. Admission is $8 for all seats. Kids ages 5 & under are FREE. UNITED PRO WRESTLING and AWA NEW SOUTH present "THE GREAT AMERICAN CLASH 2018: The Rage In The Cage" on Saturday July 14th at the National Guard Armory in Bowling Green, KY. We will be offering "Golden Circle" tickets for $15. These tickets will get you a special Meet & Greet with the legend, Jim Cornette as well as front row seating and entry into a drawing for a Wrestling Prize Pack worth over $30. Jim Cornette will be appearing during the Meet & Greet only so, your only chance to get up close and personal with him will be with the "Golden Circle" tickets. Doors open at 5:00 for the "Golden Circle" ticket holders and 6 PM for General Admission. Bell time is at 7 PM. For the FIRST TIME in Bowling Green in over 15 years, there will be a STEEL CAGE match featuring stars from both UPW and AWA New South. Plus, the ladies return and so much more. You don't want to miss the biggest event in Kentucky of the Summer. Jim Cornette has stated that he will not be making many more appearances at wrestling events so, we are lucky and blessed to have him. This could be your last time seeing him live in person at a wrestling event. So, don't miss out! Tickets ON-SALE NOW here at UPWPro.com. You can also purchase tickets EVERY Friday night in Franklin, KY at AWA New South Wrestling. - Gets You Entry at 5:00 PM for the Jim Cornette Meet & Greet, Front Row Seating to the Event, & Name Entered Into a Wrestling Prize Pack worth over $30. Hello all you UPW Wrestling fans! We are sorry for the delay and lack of updates to the site. There have been several server issues but we have been trying we promise! WE hope you have been following us on Facebook and on Twitter to keep up to date with what is going on. Major updates coming soon to the website! Thank you all for your support and we hope to see ya at ringside! 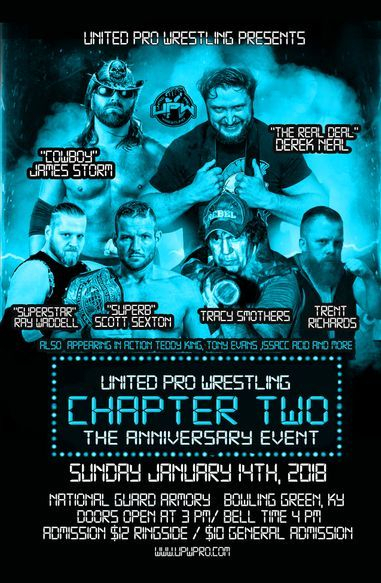 On Sunday afternoon, January 14th, United Pro Wrestling will celebrate it's 1-year anniversary and the beginning of the next chapter in our tale. Appropriately named, "UPW Chapter 2: The Anniversary Event." The action takes place at the National Guard Armory in Bowling Green, KY with a 4 PM bell time. Doors will open at 3 PM and there will be a pre-show meet & greet. Admission is $12 for Ringside (Rows 1 & 2) and $10 for General Admission. Kids ages 5 & under are admitted FREE with a paid adult. We have TWO big main events on that evening. The UPW Championship will be decided when reigning champion, "Superb" Scott Sexton defends against the man you the fans voted for, "Superstar" Ray Waddell. Oh, but that's not all. You will see former TNA World Heavyweight Champion and multi-time World Tag Team Champion as well as NXT star, "Cowboy" James Storm come to UPW as he faces off with "The Real Deal" Derek Neal. Neal has had an up and down year in 2017 with some big wins and two big losses to "The Monster" Abyss back in April and "Iron Man" Rob Conway back in October. Can Derek kick 2018 off with a bang or will James Storm show "The Real Deal" what the cowboy is made of? If those two matches weren't worth the price of admission alone you will also see "The Wild-Eyed Southern Boy" Tracy Smothers attempt to shut the mouth of "True Talent" Trent Richards. This will be Smother's return to Bowling Green for the first time in almost 10 years. Back in September, Trent Richards told Tracy he was disgusted with him and couldn't believe that Tracy would shake the hands of someone like Teddy King. Now, Tracy gets to show Trent why he has been around for so long. We will see 6 men step into the ring in a SCRAMBLE MADNESS match for the Golden Ticket. This match was originally supposed to be a ladder match. 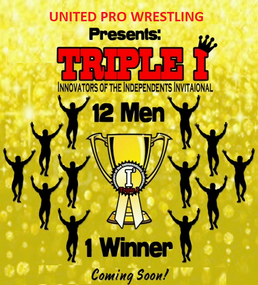 However, last week, UPW Matchmaker, Randall Shane decided he wanted to bring back a concept he created back in ICW in 2006. Scramble Madness is a unique match in itself that combines a few different match types and rules. More in that as we get closer to show date. Those men who will compete for the Golden Ticket are; Dyron Flynn, Mickey Midas, Issacc Acid, Teddy King, Trent Ware, and El Diablo Loco. The winner of the match will gain control of the Golden Ticket briefcase which can be cashed in at anytime, anywhere over the next year for a UPW Championship match. One of Kentucky's newest and hottest tag teams will make their way to Bowling Green and make their debut in UPW as The Murphy Boyz will face "Superior" Tony Evans and a tag team partner that Evans says he is keeping secret until January 14th. A lot of things have happened in 2017 but, one of the hottest and most interesting things has been the feud between The Foreign Exchange, who is comprised of the current UPW Tag Team Champions, Alexander Knight & Prince Vanderpool, former US Champion, Seth LeDuc and their manager Cortland Moore, and The System and current US Champion, Randall Shane. These men were scheduled to face off in a 6-man tag team match on January 14th but as of right now it looks to be a 3 on 2 handicap match. With Ray now getting a UPW Championship match he was pulled from the 6-man. Ray said he would fight twice but Shane and CCW told Ray he needed to concentrate on the championship match and that they would find another partner. Well, things get a little weirder from there. There is dissension currently in The Foreign Exchange. However, none of the members will speak to us about it. Long time area fan favorite and former Tennessee Heavyweight Champion, "The Boogie Woogie Boy" Gary Valiant will make his UPW debut and we will also see Trash Kan Graham in singles action against Rage. Ladies and gentlemen we can't express enough how big this night is going to be. If you are a wrestling fan, if you support UPW or hell if you support indie wrestling in any way, you will want to be in Bowling Green on Sunday January 14th. Head on over to our store and buy your tickets now before it's to late. We sold several Ringside ticket at the "Christmas Bash" so don't miss out on getting yours.